Update: Godzuki’s puppies were born on July 3rd and the game is now over. We received a lot of fantastic guesses despite Godzuki throwing us for a loop on the whelp date. In total $25 of contributions were raised, $12.50 of which went to JACA Cares by request of the prize winners, Rachael Pappas and Mira Micin. Awesome! The top three guesses are listed below. Ron Nakatani @ 743 points wow! Godzuki’s litter is due next month! We’re holding a guessing game again for anyone who wants to participate. You can make a prediction about the puppies – their date of birth, colors, and sexes. You may make as many guesses as you want. Each category is worth a certain number of points, and the player with the most points wins! Godzuki’s expected due date based on ovulation and breeding is between July 6th and 9th. All puppies should be brindle – no red or white. 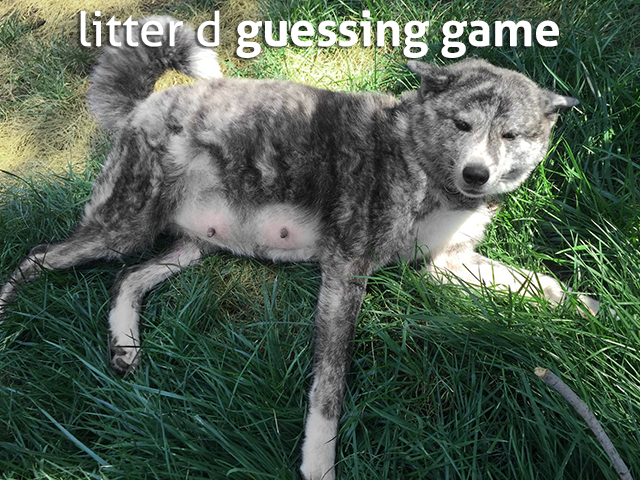 If you like, you may make a $5 contribution towards Litter D along with your prediction. (Limit one prediction per $5.) If the player with the closest prediction made a contribution they will receive a PetSmart gift card worth 50% of the total contributions. The winner may instead choose to have a donation made in his or her name to JACA Cares, a non-profit aid to Japanese Akita rescues, for the same amount. The rest of the contributions will go towards whelping supplies, puddle pads, blankets, toys, and other items for Godzuki’s puppies.